EU Casino is owned by High End-Online, whilst the site is operated by Skill On Net Limited. The casino is licensed by the Lotteries and Gaming Authority of Malta and it has up to date testing certificates ensuring fair gaming at all times. EU casino utilizes 128 bit, SSL data encryption technology, and has been providing a unique and fun online gaming environment since 2009. Whilst there are certainly better known ZAR casino online software providers, EU casino has more than proven itself since its establishment as a quality site with a superior product. In addition to South African Rand , the site operates also in Euros, US Dollars, British Pounds, and more. EUcasino offers its experience in over 20 languages including English, Dutch, Turkish, Arabic, Danish, and Spanish. EU Casino is powered and operated by Skill On Net and as such is able to provide its players with a truly unique gaming experience as many of the games can only be found here. The slots games include everything from classic slots to 50 line slots, but players can also find something really special amongst the slots games addition from various developers Net Entertainment (NetEnt), WMS, SkillOnNet, GDM, Amaya, Merkur, and Aristocrat- 3D slots! The amazing Magic and Wonders, and Vampire Feasts 3D slots are engaging and entertaining; well worth checking out. In addition to the slots, EUcasino members can enjoy American, European, and Progressive Blackjack, as well as casino holdem, baccarat, craps and more amongst the card games. The roulette comes in 5 forms: American, European, French, American Machine, and European Machine. There's a bunch of video pokers to choose from plus some other games such as Doubles-Heaven and Hi-Lo. 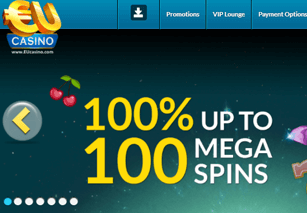 In total there are around 80 games available for play at EUcasino, most for either real money or fun play. There is a huge selection of bonuses and promotions available to EU ZAR Casino players, with a different promotion running literally every day. The Promotions Calendar will illustrate exactly what promotions are available on any given day, from happy hour bonuses, to VIP points giveaways. New ZAR Casino players can benefit from a 100% Up to 100 Mega Spins with the EU Casino welcome bonus. Existing players don't miss out either; there are races and tournaments, VIP promotions, and reload bonuses running around the clock. The customer support team is available at EU casino around the clock via telephone, fax, email, and live chat. Mastercard, Skrill, Visa, Ukash, WebMoney, NETELLER, Wiredcard, ClickandBuy, ENTROPAY, Click2Pay, POLi, PaySafeCard, iDeal, Przelewy, Euteller, BankLink, SpeedCard, eWire and many more.